Pruning is done in winter for many trees, particularly fruit trees, and the instructions frequently use the phrase “prune to an outward facing bud”. I always feel that this is something of an oversimplification and it helps for gardeners to understand why this advice is given to help make the best decisions about where exactly to make those pruning cuts. Pruning to a bud is important because the sap only flows up to a part of the plant that is growing: a side shoot or a bud. 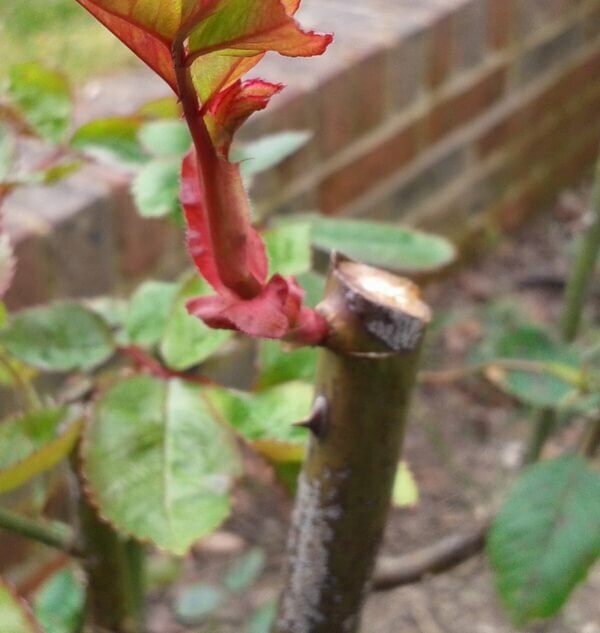 If you cut a stem between buds then the piece left above (the snag) will receive no sap and it will die. This can cause the bud and the stem lower down to die back too especially in Roses. So always cut right above a bud or shoot and make a sloping cut so that water does not sit on the cut surface. In most plants buds appear on alternate sides of the stem (like Roses), some have buds in pairs on either side (like Hydrangeas). Buds develop into shoots that grow in the direction that the bud is facing – hardly a surprise when you think about it! In most cases you want the main branches of a tree or shrub to form a goblet shape with an open centre letting in light and air. Therefore you would prune to a bud on the outer side of the stem, pointing away from the centre of the tree or shrub – this is the meaning of “outward facing”. However this might not be the case if you are replacing an old stem in the framework or extending the reach of a climbing rose. The best and simplest message is to choose a bud that is pointing in the direction you want the new shoot to grow. And this principle is the same whether you are pruning a tree, a shrub or a training a climber. ← Gardening trends – where is gardening going?